The 5th / 6th Grade Choir is an elective for 5th graders and a graded class in 6th grade, based on the students’ work during rehearsals, their readiness to perform our choral repertoire, and their participation in the required after school performances. Any 5th or 6th grade student who wishes to participate and who continually demonstrates satisfactory effort and conduct in rehearsals may be a choir member. No audition is required. Every second year the entire choir presents a stage musical. 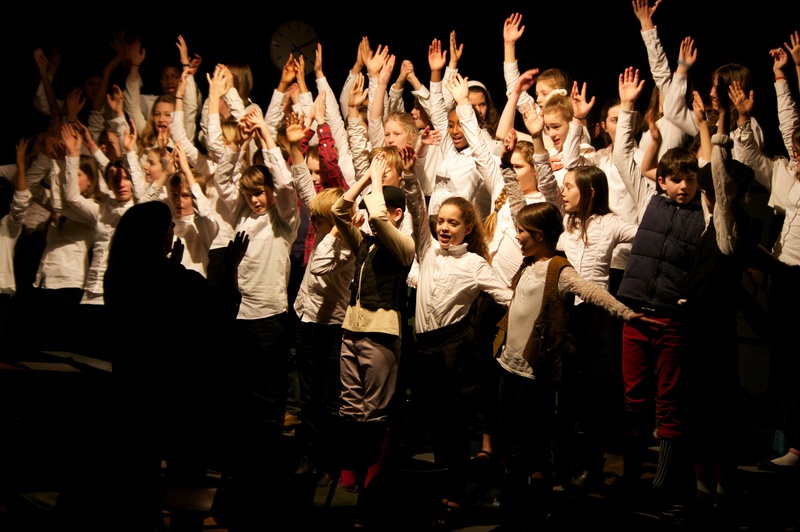 All choir members are part of the chorus, stage roles are chosen by audition. 5/6 Grade Students who are interested in singing in a choir, but who are not ready for the high level of commitment necessary for the Performing Choir are encouraged to take part in the Casual Choir, a group which meets for one half lunch period twice a month. Interested students should see Ms. Cook during a 5th period to enroll for the Casual Choir. Enrollment is open all year for the Casual Choir.